Over the weekend of 18-22nd July we welcomed the parish priest – don Fabio and sixteen parishioners. We joined with them and many of our own parishioners on a two day pilgrimage to Walsingham in Norfolk – the site of an 11th. Century vision by Richeldis de Faverches which resulted in it becoming a place of Christian pilgrimage through the ages. We visited both the Catholic and the Anglican Shrines in the village and took part in joint acts of worship. Following a visit to Wells next the Sea we returned to Sharnbrook and following a joint benefice Holy Communion service in St. Peter’s on Sunday 21st. July at 10.15 a.m. at which the Bishop of Bedford celebrated, we enjoyed a benefice lunch together in the village hall. Below: Rt. Revd. Richard Atkinson - Bishop of Bedford with don Fabio and our friends from Calpino. For further pictures click this link. Following a difficult period for the parish of Calpino and don Peppino’s untimely death earlier in 2012 don Fabio, a young priest who had helped in the parish and carried on the ecumenical work, was appointed permanently by the new Bishop of Urbino. It was with joy therefore that we were invited to take a group of people back to Calpino to renew our link with old and new friends of the parish. Led by Rev. Robert and Caroline Evens the group also contained: Colin & Hazel Scott, Pam & Martin Tidy, Paul, Caroline and Oliver Hayward, Judy Lee, Alexandra, Stephanie and Christian von Caron. For seven of the group this was their first visit. We stayed with families in the parish, which despite the language difference, is always the best way to experience the wonderful Italian warmth and hospitality. We were not disappointed. On Friday 2nd. November (All Souls Day) we were taken to the beautiful hilltop medieval village of Monteguiduccio where don Peppino had been born and was now entombed. We were privileged to share in the Mass held outside the small cemetery chapel joined by many others who were also remembering their loved ones. Later that day, we were taken to an ecumenical gathering in Fano where representatives from all three dioceses were addressed by Robert on ‘Preaching the Gospel in an Anglican Parish.’ Quite a daunting task, but delivered with his usual light style and with a pre-translation provided, it was well received by all. The discussion groups which followed gave us all useful windows into each other’s faith and challenges. 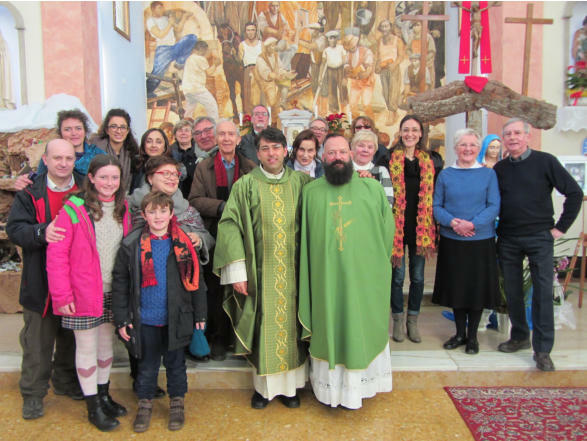 After a day in Urbino and some surrounding villages on Saturday it was a fitting conclusion to participate in the main Sunday Mass in Calpino on Sunday morning. The 57th. Anniversary of the Church was being celebrated and the Bishop of Urbino was present to welcome us and join us in the excellent lunch which followed. Fourteen people from the benefice including, for the first time, four from St. Mary’s Felmersham went on this visit which included a Pilgrimage to Loreto with don Fabio and our friends in Calpino. We spent the first night at the John Paul II youth centre in Loreto where we were welcomed warmly by the Chaplain - don Paolo and Sister Marija, who spoke good English and helped us with all our needs at the centre. Sister Marija also prepared a vigil prayer which we held that evening at the Holy House of Mary at the Basilica. We were joined by by don Fabio and an advance group from Calpino and this private, spiritually moving service gave us a great start to the weekend. On Friday morning, a coach arrived from Calpino with more of our friends and we all returned to the Basilica for a guided tour of the upper fortress and time to explore the many internationally sponsored chapels of the Basilica itself. We then returned to the J.P. II centre for lunch before setting off for Calpino via the beautiful nearby resort of Numana where we had time to explore and have gelato. Having settled in with our family hosts in Calpino, on Saturday we had a relaxing day in Urbino as many of our group were visiting for the first time. We had lunch at the diocesan office and were treated to a guided tour of the magnificent Ducal Palace before returning to dinner with our hosts. On Sunday we were as usual welcomed to join and participate in the main mass at the church of ‘Christ the Worker’ Jane Templeman and Laurie Mills read the lesson and Gospel in English and Andrea translated don Fabio’s sermon. After our great lunch together in the new Parish Room next door, more fun was had at the evening Taglitelli Festival in nearby Fermignano. As always - an amazing weekend both spiritually and socially, further cementing the link between our parishes.